This is what they do to everyone who fights back. In which we find out what happened to Luke, and if June sent a message. On the one hand, after the events of the previous episode I found myself frustrated by our return to the first episode and a glimpse of Luke's side of the story. I was so shocked after the banquet and all the revelations (the Children of Gilead) and overwhelming truths (Wombs for Chocolate) in the last few seconds of June's story that the jump back to the beginning again felt like walking off a cliff. I so wanted to find out right away if and what she wrote to Luke. It turned into an exercise in delayed gratification, and like many such exercises, well, I guess it was good for me. This episode showcases a dual storyline tracking Luke's experiences three years ago after he and June are separated, and his family's experiences turning into refugees. 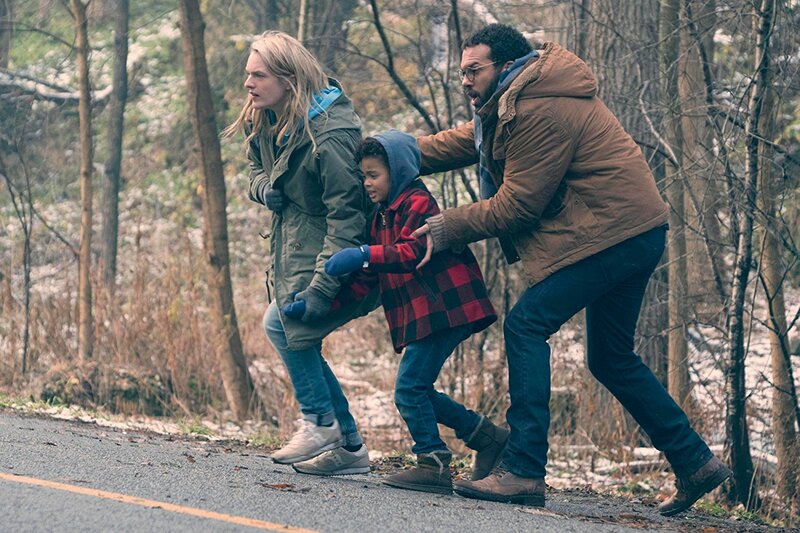 The family's experience of escape in the past were simply harrowing; from the first moment it's full of despair, with June admonishing Luke that they'd left too late, and Luke meekly defending that they had a child, it was different. Their plan solidifies as we watch: they've connected with some sort of support network which is going to smuggle them to safety. It's clear June has a survivor persona above and beyond that of Luke; she's the first to take out the backpack and the first to be willing to get into the trunk (although she panics a bit once inside, leading to the very cute June-bug scene.) Maybe it's simply that she's a woman and the entire experience has struck her more powerfully and her ESCAPE NOW button has been blinking for a while. While Hannah pops up cutely here and there, the essence of this episode is the dynamic between June and Luke, how they reflect and complement each other. Throughout Luke is simply disbelieving; I'm not sure if he would have left Brookline at all without June's prodding, and I'm not sure he fully takes in that Whitford has been hung. In this episode we finally see men, good and bad, support the family and theoretically other women and their families in their attempt to escape; one turncoat Guardian, one cranky but good-hearted secret refugee routekeeper, and one hunting neighbor passing on a warning. So this show is not completely dismissive of men possibly having a good side and helping, which does make one feel hopeful. But I'm also mindful that it looks like Luke has to witness more men dying and suffering before it really hits home how awful this regime is and the lengths to which they are going. This is not a commentary on Luke, but it might be a commentary on humanity. How many of us don't really do anything until we see someone like us get hurt? And then they come for us: and nobody is left to speak up for us. That's how the Niemoller quote goes, right? But once the disbelief and shock are pierced, the men do seem to fight back. In the present time-track, Luke is rescued by a group of refugees including a kind ex-nun and a wisecracking homo, as well as a former Handmaid, led by Zoe (Rosa Gilmore). When the ex-nun confesses the possibility that June is being used for her fertility, Luke is shocked and angered and shocked, but in the end does decide to go off and rescue her; Zoe forces Luke to visit a church see the hung-up bodies of a town which resisted Gilead's forces and makes him realize his efforts would be useless. A hard truth, but probably correct. Luke goes off to Canada instead. Their boat is hijacked and Zoe is shot; Luke leaves holding the ex-Handmaid safe from bullets, echoing how he comforted June in the car. 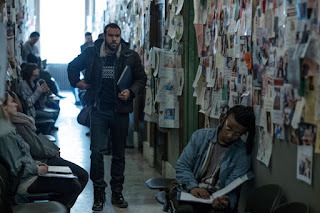 The end of the story sees the convergence of the storylines to today – where, three years later, Luke and his former-Handmaid friend are hanging drinking tea in Little America, in Toronto, Canada when he's called in to an office which is clearly connecting survivors and families. He's given a note from June, and in a beautiful moment symbolizing their nearness in spirit, reads it: I love you. Save Hannah. I admit I found my spirit badly crushed by the implications of the previous episode, and the end of this episode brought me full circle back to that crushing of the spirit. I think the picture for her and the other women painted by the series is even bleaker than that painted by the book, and this wrung my heart. I think the implication of the discussion with the Mexican ambassador is that the entire planet is now a prison for fertile women and it really doesn't matter because there is no escape. No matter where she goes, she is now commodified for her working reproductive systems. That's why the message we finally get to see is what it is. Save Hannah. Because Hannah's still young enough and there's no hope for June. I can't stop watching though, and I hope that this show plans to help June, as she said once, find happiness. The graffiti in the past, including God Hates Fags. So many elements from things happening today. June drugging Hannah with Benadryl. I'm fairly sure my mom did the same occasionally. The moment when the trunk opened and we saw the gun. I know I'm not the only one who jumped! The pancake moment, and it makes sense for Luke to have taught Hannah how to cook; the new Ofglen reminded us that Luke was into cooking. The memorial hallway. The pictures and messages on those walls struck me to the core. Luke (to the nun): I'm sorry for all the fucks. Hannah: We're out of syrup! Luke: That's because you eat pancakes every day. Hannah: I'm going for a world record! I admit to being down on Luke in the beginning. "Where have you been for three years?" But it's clear the effects of this societal upheaval are being felt just everywhere. Moss and Fagbenle have great energy. Five out of five rescue buses. That last paragraph you wrote about there being no escape -- that got to me, Joseph. Some very nice writing there. This episode made everything look even bleaker. Throughout the entire episode, I found myself impatient to get back to what was happening to June. And yet, this episode was really very good; it felt out of place only because it was a departure from all of the previous episodes in this exceptional series. I thought the most interesting thing about it, other than the glimpses we got of the world right outside Gilead, was that Luke had ended up living with another Handmaid who even looked a bit like June. Great review, JRS! I think you helped me like this episode more by showing its strongest points. I didn't like this episode when I watched for a reason that isn't justifiable: after everything we have seen women suffer, and June in particular, I just didn't wanna see man’s experience of women’s oppression. I know this opinion seems limited and there was much more to the episode than it - it is valid to see how man are experiencing this "new world"! - , but it was stronger than my rational me. But it is a good episode in many aspects, which you have highlited wonderfully, despite the feelings it generated upon first watching. There is something that still bothers me... 3 years latter and Luke is still thinking about Handmaids-in-training? I know Gilead tries its best to keep the truth from coming out, but there are leaks - we see in a episode that an Aunt spoke about it. I imagine there are many theories and rumors. It just seems to me if Luke should be a bit more caught up with the situation. Nice review, but I'd like to say that use of the word 'homo' doesn't sit well with me. Here in the UK it's a prejorative term. Is that not same in the U.S.? Greate review JRS. Very to the point. I was shocked with the comparison between today's refugees (Syria and Iraq) to them. It did hit close to home. Would we have let them in? probably not. The reason I wrote that sentence that way was because I was bitterly riffing on the God Hates Fags signs. In the show itself, the gay character on the bus calls himself 'a gay', which had the tone of an insult in itself. I have a feeling that the men of Gilead would be using homo, or fag, or much worse - it's not that I support or suggest the use of the term itself. Now I'm conflicted about it! May remove. We'll see. Thanks for the feedback. Ah, I understand your intention in that context now.